Alyse and Carlos’s wedding will leave you breathless! Andreita and Faysal had a perfect wedding: a beautiful day, ocean view, and a great party! 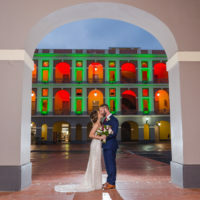 Happy and relaxed wedding at timeless Old San Juan. Amanda and James eloped in Puerto Rico during their recovery mission trip. The happiest, most relaxed destination wedding! ¡Nos fuimos para mi pueblito Mayagüez! ¡Que día y pareja tan especial! ¡Un día súper feliz y relax!